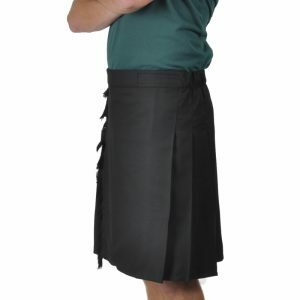 The Ultimate Kilt comes with optional cargo pockets, sewn down pleats, and 3″ belt loops. There is velcro on the inside of the kilt for adjustability, as well as a small Sport Kilt logo on the pocket storm flap. We also stitch vertically along the knife edge of the pleat, all the way down to the bottom hem to help the pleats keep their shape even better. Since there is no elastic in the waistband on this model, please give us your actual waist and hip measurement (in inches) as well as the desired length. Other options are also available, i.e., leather buckle straps, fringe, and hidden side pockets. Please allow about 3-4 weeks to complete, plus shipping time. 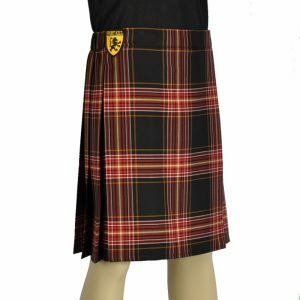 Please note: Since this is a custom made garment, we cannot accept returns or exchanges if we make the kilt properly to your measurements . Please measure carefully.